I’ve become more convinced than ever that we’ve barely scratched the surface of what this craft is capable of. I’m more driven than ever by ideas that I want to explore than by repeating ones from the past. I want to discover and learn how to represent the power of a place. I want to play with scale and space in a scene. I want to see how lighting creates a mood and emotion. None of the criteria we typically obsess over has anything to do with this. The photo above gives a hint of where my thinking is going these days. 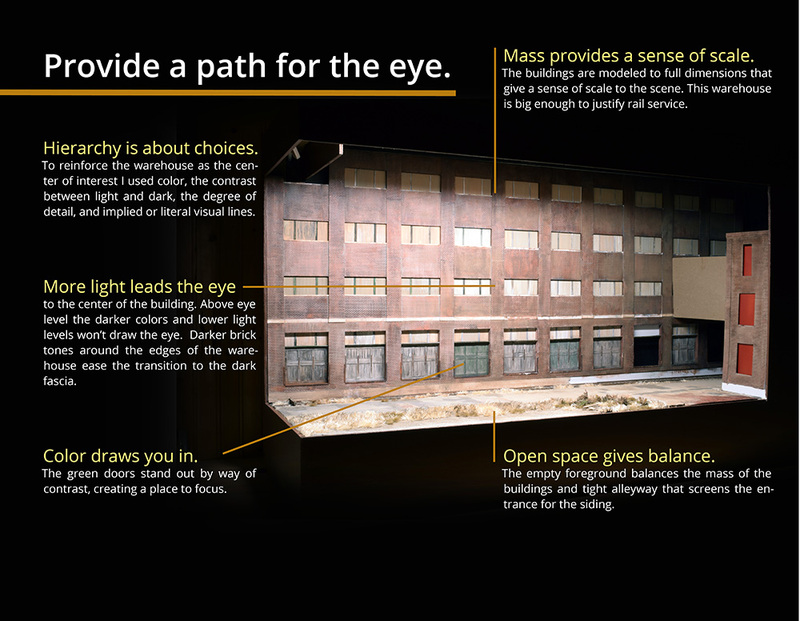 It’s from a new ebook I’m working on about urban modeling. I tend to see more of these criteria at work these days in the modeling coming out of Europe and Scandinavia than North America. Many of the layouts exhibited at Ontraxs in Utrecht, et al, seem to be based on similar principles of design. While I am discouraged at the lack of interest in this approach here in the U.S., I am encouraged that our renaissance may only be delayed. The ideas of the Art Deco movement were emerging well before the 1925 exposition in Paris, and a few years later began to find expression in the U.S. With the internet allowing for the cross-pollination of ideas around the globe, there will be modelers drawing inspiration from and being influenced by modelers such as yourself and others promoting these ideas. But like the Art Deco movement in society, a more measured, reasoned design approach may only ever infiltrate the hobby to a limited degree, and will likely be superseded by another movement in time. A few thoughts on this posting. 1) Art education, or the lack thereof, in schools today. All your points, every single one above, is about composition, value (light/dark), color and (critical in modernist art) every single thing in the canvas having a point to support the whole impression. These are key points of what makes art into art rather than just a picture–but who gets education on observation these days? People just don’t know better, I fear. Build a kit, paint it, place it. Great layouts, no matter the size, stand out visually because the key components are taken into consideration. Gordon Gravett’s Arun Quay should be absolute must study material for anyone looking to push their skills and thinking forward. How many other modelers consider atmospheric perspective, muted colors and open spaces to drive vastly improved environments? 2) To Galen’s point, the design approach will be lost IF people don’t continue to share (and push) it. There is so much more great design out there than when I stumbled into the hobby in 1970, but it does remain the absolute minority, and possibly will. But that minority drives big change that becomes mainstream: Think John Allen putting birds and their droppings on his engine house in 1948 radicalizing how people thought about weathering. Europe has the advantage of frequent shows actively participated in by layout builders. Small space and competition (and the rejection by venue managers of mediocre layouts) leads to improving quality and creative thought. I’ve seem plenty of uninspiring layouts at these shows but the stand outs are noticed and copied by those willing to move things forward. 3) The mainstream press all but ignores these topics and layouts in this country, as well as not pushing awareness and availability of great books widely available overseas. Barry Norman, Iain Rice, John Singleton, Gordon Gravett, etc., produce incredible references that spark the mind and lead to increasing quality in those who want to pursue it. 4) Other ideas from the likes of Lance Mindheim are finally percolating across a larger audience: Building within your means (time) and to your true interests. Small is fine, and may be better than big. Experiment, build, move on. Plan and build so that things are operating early to hold interest as you approach the slower items. We don’t see more refined modeling often because people just don’t have the time to build the big layouts that are pushed as the ideal. Maybe they start but they peter out. And I think, at heart, that we’re all intimidated by the effort needed for these big layouts and many just stay armchair modelers. Modelers do change for the better, if slowly. Look at prototypical modeling and weathering, which are very much part of the norm now, not the exception as they were in the past. It took a lot of teaching people to get there–and backing by the mainstream press. The big magazines move slowly and promote what they think sells and it generally doesn’t seem to be finescale small layouts that leverage artistic and theatric knowledge. They’re getting better, but I don’t think it’s there yet. But we, as individuals, can step up by exploiting forums and blogs, and through opening up our layouts to others–exposing more people to what is possible. Mercy, what thoughtful comments from both of you. Thank you. I want to respond with more depth and will do so in a separate post rather than here. My idea of modeling trackside structures full scale is driving the design on my upcoming layout (yes I finally made a decison on what scale). I hate the look of selective compression, so as a result, my full size industries take up a lot of real estate. I don’t plan on modeling the whole building, but the facade facing the layout will be as close to full scale as my space allows. Interesting point: maybe “selective compression” of structures (leading to factories barely larger than the box car bringing in raw materials) is the scenic equivalent of filling every available square inch with track, including train set turnouts? Clearly your professional knowledge impacts your modeling choices, which I find very interesting. You know what things actually look like and the typical cartoonish versions and tactics we employ don’t seem to cut it for you. I get it and I applaud your determination to work out a design that suits you. What other criteria do you use? I would say that most of my decisions are driven by the need\desire to replicate the prototype. For example, the difference between a #9 turnout and a #6 turnout might not be perceptible to most, but when I see a 4 axle locomotive sitting with one axle on the frog and the other axle on the points, it looks wrong. I know that even with a #9 turnout, a 4 axle unit can sit with one axle free from the points and the trailing axles still off the frog. I think that I see the relationship between the railroad and its workers. In your photo above, I can see space for the Switchman on the ground to walk beside his train as he is spotting the boxcar. The openness of the scene is appealing and looks correct. Thanks for getting me talking about this, its a good reminder to try and get off my rear end and restart my long dead blog.